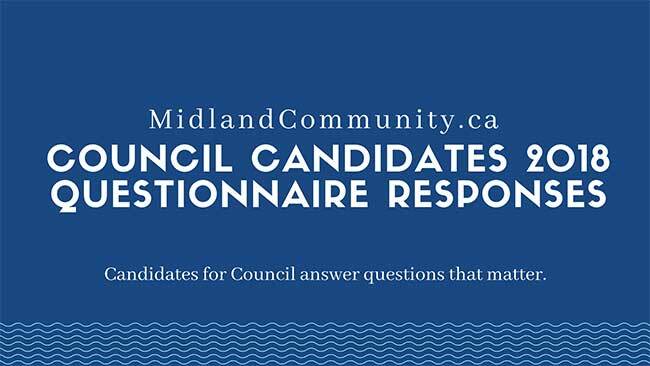 MidlandCommunity.ca invited all candidates running for Council in this year’s election to respond to four important questions. We believe the answers provide all voters with additional information to make a more informed decision on who is best suited to lead Midland to a better and brighter future. When you cast your vote on October 22nd, please consider the best talent capable of getting Midland back to work through an unrelenting focus on supporting those things that matter most. I want to improve the quality of life of the community with great municipal services. I have increased my knowledge and passion for public policy during the last term of council. I want to continue to actively participate with policy development. I have a degree in civil engineering and society with professional experience with the private and public sector, and I have utilized continuous learning and a multidisciplinary approach to public policy. Livable Communities: focusing on key municipal services to improve livability, accessibility and prosperity. Simple and effective public realm improvements like Urban Tree Management, Beautification, and community safety initiatives achieve multiple community goals. We can maximize our capital and natural assets to make Midland an active, healthy and sustainable community. Because Midland is a great place to live, it’s a great place to visit, the secret is out! Modern Multi-modal Transportation Policy: Tremendous opportunity with the upcoming multi-modal transportation master plan to incorporate complete streets and vision zero principles to make Midland safer, age-friendly, walkable, and cycle and transit friendly. Community and Economic Development: Smart Planning Policies that promote growth and revitalize our downtown. collaborative public art project ‘Paint the Park – 2017’. B. Modern Transportation Policy – Advocated for healthy and active community through infrastructure improvements. I have been an advocate for walking/cycling initiatives, as well as advocating for Transit upgrades and improvements. C. Active committee member – I have used my knowledge of engineering and urban planning to benefit the Town of Midland. Steering committee member for Midland Bay Landing , Official Plan Review, Downtown Revitalization . Vice chair of Planning/Development and chair of the Active Transportation Advisory committee . Be the first to comment on "2018 Council Candidate Questionnaire Response – Jonathan Main"